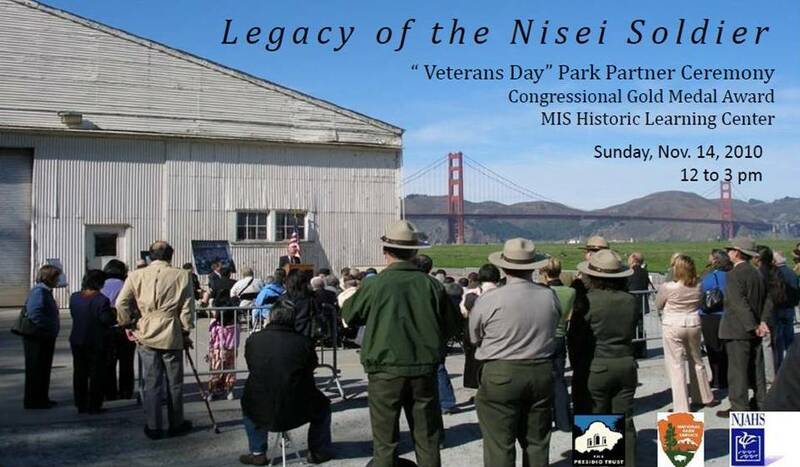 On Sunday, November 14, 2010 NJAHS held a Veterans Day event at the Officer's Club of the Presidio entitled "Legacy of the Nisei Soldier". It was a warm and sunny autumn day in the San Francisco Presidio as 160 Nisei veterans, their families and honored guests gathered to commemorate those who have fallen in the service of their country and to honor those who served and are still with us. With the call to the colors, the pledge of allegiance and the playing of the "Star Spangled Banner" the program began. The speakers included Colonel Daniel D. Pick, Commandant DLIFLC; Craig Middleton, Executive Director of the Presidio Trust; Stephen Haller, Park Historian, GGNRA/NPS; Consul General of Japan Hiroshi Inomata; Larry Oda, Japanese American Citizens League; Colonel Thomas Sakamoto (RET), MIS First Class; Rosalyn Tonai, NJAHS Executive Director; and Joe Takano, NJAHS Board of Directors. Colonel Pick talked about the contributions of the original MIS and the development of the Defense Language Institute. Colonel Sakamoto spoke about his personal history and the challenges faced by the original MIS. The audience was treated to accolades for our veterans of the 100th Infantry Battalion, the 442nd Regimental Combat Team and the Military Intelligence Service. It was noted that the Congressional Gold Medal has recently been awarded to the Nisei veterans of those outfits. Special mention was made of the project of the NJAHS, the Presido Trust and the National Park Service to preserve Building 640 in the Presidio, the home of the first language school of the World War II Pacific War which was the training ground for 60 almost all Nisei language interpreters. The important of procuring contributions toward the completion of an interpretive learning center there was made. Those in attendance were treated to a sumptuous pasta lunch and the afternoon was capped off by the screening of a new DVD version of a film about the Military Intelligence Service by gayle yamada entitled "Uncommon Courage". A good time was had by all on this solemn commemoration which included aging veterans as well as their younger offspring.